The aim of Adaption and Resilience in eastern Africa is to provide a longer-term historical perspective on human-environment interactions to enable future long-term sustainable use of East Africa’s fragile environment and resources. 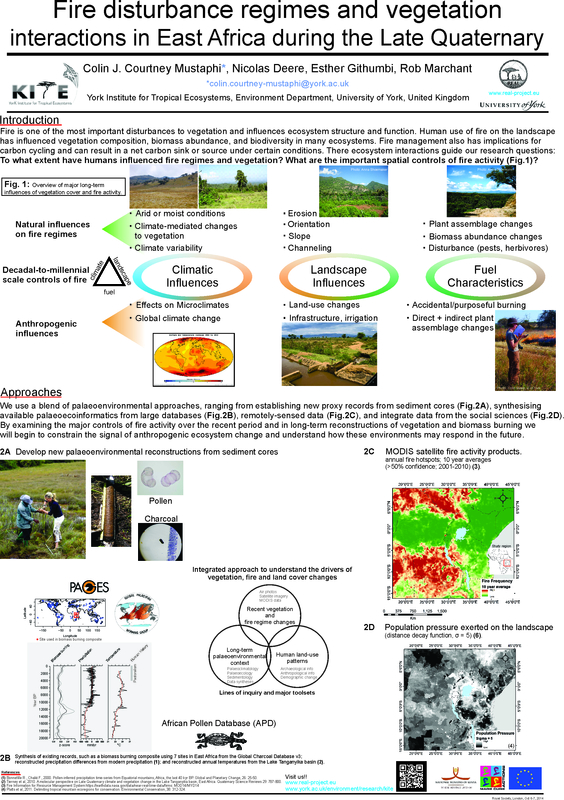 The regional project builds on the earlier research projects Historical Ecologies of East African Landscapes (HEEAL) (now completed); Resilience in East African Landscapes (REAL) now completed) and the ongoing Adaptation and Resilience to Climate Change (ARCC, see below). Together we focus on the temporal, spatial, and social dynamics of human-landscape interactions in East Africa over the last millennium. The issue of adaptation and resilience to climate change remains hotly debated due to complexities and challenges inherent in the understanding of our relationship with the environments and changing in climate systems as well as those inherent in in the adaptation and resilience process. The growing incidences of extreme events (floods and droughts) due to a changing climate are increasingly seen as a major risk affecting economy, food security, health, ecosystems, biodiversity and people’s livelihoods. Faced with human-caused rapid change in climate, policy, behavioural and livelihood changes, and ensuing trade-offs that are being made between socio-economic development goals and environmental sustainability targets (as stipulated by SDGs). the Swedish Research Council, VR in association with Sida) is to address how socioecological systems may respond under future climate change and social scenarios? We ask how socioecological systems in the study area have changed over the past 300 years? Climatic and vegetation data from the last 300 years help us understand how ecosystems have responded to past climate change, and how will it may respond to climate change in the future. We also explore how the biodiversity of the region been generated, how is it maintained and how biodiversity protection impacts livelihoods today? ARCC will use past societal and ecological trends to examine the use and relationships between people and ecosystem services through time and under different landscape management regimes, to better predict how human-environment-societal- wildlife relationships may respond to future climate change, management interventions and societal use. Focusing in the semi-arid landscapes of the north-western Tanzania we will present a c. 300 year environmental history derived from a synthesis of radiocarbon-dated sediment cores from swamps and lakes. Changes in vegetation and charcoal counts are associated with climatic changes, fire activity and anthropogenic activity, much of this associated with the increasing population, partly tied into the caravan trade of the 17 and 18th centuries. Sedentary agriculture has intensified dramatically since the colonial period, a transition accelerated during post-colonial administration under the most recent expansion has increasing been focused around the boundaries of protected areas, severely challenge the adaptive capacity of plants, wildlife and the rural communities depending on them. Information from long-term data and perspectives is crucial to facilitating the policy processes and adaptation actions and building resilience and sustainable management of the ecosystems under current and future climate change. Current land use transformations are similarly having a large impact on the swamps (left) provide dry season grazing resource, particularly vital during dry seasons and that are becoming increasingly severe and prolonged, are a stark contrast to wetlands just outside the protected areas that are drained and converted to agricultural production (right). The palaeoecological component of ARCC analyses a range of palaeoenvironmental proxies including pollen (Fig 2), charcoal, geochemistry, fungal spores, macrofossils, phytoliths and testate amoebae on a series of sediment cores from the Serengeti region to document past environmental changes with high spatial and temporal resolution. A number of cores derived from the area are already under analysis, with preliminary results indicating significant change throughout the past 1,000 years. Scenario approaches are useful in planning future adaptation strategies as they offer the opportunity to consider combinations of change, such as how projected climate change impacts, socio-economic trends, and local production and governance systems interact. As they explore multiple alternatives, scenarios can also account for uncertainty around the future events and the impact of different development pathways. We will apply participatory scenario modelling framework to explore potential adaptation strategies to projected climate change in ARCC study area and their consequences on the landscape and carbon storage. Local stakeholders that represent a cross section of society will be engaged in developing scenarios representing how their landscape would look like by mid-21st century if climates change, following AFRICLIM projections. The project is lead by Paul Lane at Uppsala University and involves Anneli Ekblom (Uppsala University), Linus Munishi (Nelson Mendela African Institute of Science and Technology, Arusha), and Rob Marchant (York). Claudia Capitani (NM-AIST and University of York) and Colin Courtney-Mustaphi (Uppsala University and University of York) will be spearheading new projects, participatory events, and outreach components in the coming years focused in and around northwest Tanzania, including Serengeti National Park. The Marie Curie Initial Training Network brought together ecologists, archaeologists, anthropologists, geographers, historians and agronomists providing cross-disciplinary training to a new generation of researchers, enabling them to interpret data relating to past and present socio-cultural and ecological dynamics from across the environmental and social sciences and the humanities. Organized by researchers from seven European universities (Uppsala University, University of York, Stockholm University, University of Cologne, Warwick University, Ghent University and EHESS University of Paris I) in partnership with private actors, the ITN cooperated also with academic counterparts, private-sector stakeholders, NGOs and local communities in East Africa. The project consisted in 10 subprojects that are now completed. See much more detail in the REAL project webpage. REAL members, in November 2013, Uppsala University, Sweden. Kariuki R, Marchant R, Willcock S (2018). Ecosystem services in Africa. In: Binns T, Lynch K and Nel E (eds.) The Routledge Handbook of African Development. Routledge, Oxford, UK. Gallego-Sala A, Charman D, Brewer S, Page S, Prentice IC, et al 2018. Latitudinal limits to the predicted increase of the peatland carbon sink with warming. Nature Climate Change. Shipton C, Roberts P, Archer W, Armitage SJ, Bita C, Blinkhorn J, Courtney-Mustaphi C, Crowther A, Curtis R, d’ Errico F, Douka K, Faulkner P, Groucutt HS, Helm R, Herries AIR, Jembe S, Kourampas N, Lee-Thorp J, Marchant R, Mercader J, Pitarch Marti A, Prendergast ME, Rowson B, Tengeza A, Tibesasa R, White TS, Petraglia MD, Boivin N. 78,000-year-old record of Middle and Later stone age innovation in an East African tropical forest. Nature Communications 9, 1832. Bollig, M, Anderson, D. (eds.). 2017. Resilience and Collapse in African Savannahs. Causes and Consequences of Environmental Change in eastern Africa. London. Routledge. Bollig, M. 2017. Adaptive cycles in the savannah: pastoral specialization and diversification in northern Kenya. In: M. Bollig and D. Anderson (eds), Resilience and Collapse in African Savannahs. Causes and Consequences of Environmental Change in eastern Africa. London. Routledge. pp. 21-44. Pas Schrijver A, Lenkaina D. 2017. Grazing management and livestock mobility in Lekiji Sesia, Kenya. Printjob: Hoogeveen, Netherlands. pp 52. ISBN PDF 978-91-87355-37-0. Shoemaker, A.C., Davies, M.I. and Moore, H.L., 2017. Back to the Grindstone? The Archaeological Potential of Grinding-Stone Studies in Africa with Reference to Contemporary Grinding Practices in Marakwet, Northwest Kenya. African Archaeological Review, pp.1-21. Gravesen, M, Jensen, S. 2017. Etnisk og politisk strid om jord ryster et af Afrikas mest stabile lande. Information. 18 April 2017. Kioko, E.M., 2017. Conflict Resolution and Crime Surveillance in Kenya: Local Peace Committees and Nyumba Kumi. Africa Spectrum, 52(1), pp.3-32. Hawthorne D*, Courtney Mustaphi CJ*, Aleman JC*, Blarquez O, Colombaroli D, Daniau A-L, Marlon JR, Power M, Vannière B, Han Y, Hantson S, Kehrwald N, Magi B, Yue X, Carcaillet C, Marchant R, Ayodele O, Githumbi EN, Muriuki RM. Accepted in press. Global Modern Charcoal Dataset (GMCD): a tool for exploring proxy-fire linkages and spatial patterns of biomass burning. Quaternary International. Bollig, M. 2016 Towards an Arid Eden? Boundary making, governance and benefit sharing and the political ecology of the “new commons” of Kunene Region, Northern Namibia. In: Pastoralism and the new commons: Co-management, conflict and cooperation (Guest editors: M. Bollig and C. Lesorogol). International Journal of the Commons 10(2). Bollig, M., Olwage, E. 2016. The political ecology of hunting in Namibia’s Kaokoveld. From Dorsland Trekkers’ elephant hunts to trophy hunting in contemporary conservancies. Journal of Contemporary African Studies 34, 61-79. Hazard B, Adongo C. 2016. Green grabbinget modèles de conservation dans le comté de Marsabit. Cahier de l’Afrique de l’Est, No 50. Adongo, C. 2016. From Sacred Groves to Cultural sites: the role of socio-economic dynamics in the conservation of Kaya Mudzi Muvya, Kenya. In: Marie Pierre and Sophie Blanchy (eds.) Revalorisation patrimonial des sites naturels sacrés (Kenya, Ouganda, Madagascar). Enjeaux lovaux, nationaux et internationaux. Journal des africanistes. TOME 86. ISBN 978-2-908948-44-8. Pauli J, Bedorf F. 2016. From Ultimogeniture to Senior Club. Negotiating Certainties and Uncertainties of Growing Older between Rural Mexico and Urban Chicago. In: Wonneberger, Astrid, Mijal Gandelsman-Trier; Hauke Dorsch (eds.). Migration, Networks, Skills. Anthropological Perspectives on Mobility and Transformation. Bielefeld: Transcript, 47-66. Lane, Paul J. (2016). Places and paths of memory: archaeologies of East African pastoralist landscapes. In J. Beardsley (ed.) Cultural Heritage Landscapes in Sub-Saharan Africa. Harvard: Harvard University Press (Dumbarton Oaks Texts in Garden & Landscape Studies), pp. 193-234. Lane, Paul J. (2016). Entangled banks and the domestication of East African pastoralist landscapes. In F. Fernandini and L. Der (eds.) Archaeology of Entanglement. Walnut Creek, CA: Left Coast Press, 127-150. Chuhila, Maxmillian and Andrea Kifyasi (2016), ‘A Development Narrative of a Rural Economy: The Politics of Forest Plantations and Land Use in Mufindi and Kilimanjaro, Tanzania; 1920s to 2000s’ International Journal of Social Science and Humanities Research 4, No. 3, pp. 528 – 538. Anderson, David M. and Michael Bollig (2016). ‘Resilience and collapse: histories, ecologies, conflicts and identities in the Baringo-Bogoria basin, Kenya.’ Journal of Eastern African Studies 10, i: 1-20. Anderson, David M. (2016). ‘The beginning of time? Evidence for catastrophic drought in Baringo in the early nineteenth century.’ Journal of Eastern African Studies 10, i: 39-61. Onyekuru, N.A. and Marchant, R., 2016. Assessing the economic impact of climate change on forest resource use in Nigeria: A Ricardian approach. Agricultural and Forest Meteorology, 220, pp.10-20. Howard, R.J., Tallontire, A.M., Stringer, L.C. and Marchant, R.A., 2016. Which “fairness”, for whom, and why? An empirical analysis of plural notions of fairness in Fairtrade Carbon Projects, using Q methodology. Environmental Science & Policy, 56, pp.100-109.Crowther, A., Faulkner, P., Prendergast, M.E., Quintana Morales, E.M., Horton, M., Wilmsen, E., Kotarba-Morley, A.M., Christie, A., Petek, N., Tibesasa, R. and Douka, K., 2016. Coastal subsistence, maritime trade, and the colonization of small offshore islands in eastern African prehistory. The Journal of Island and Coastal Archaeology, 11(2), pp.211-237. Simon Willcock, Oliver L. Phillips, Philip J. Platts3, Ruth D. Swetnam, Andrew Balmford, Neil D. Burgess, Antje Ahrends, Julian Bayliss, Nike Doggart, Kathryn Doody, Eibleis Fanning, Jonathan M. H. Green, Jaclyn Hall, Kim L. Howell, Jon C. Lovett, Rob Marchant, Andrew R. Marshall, Boniface Mbilinyi, Pantaleon K. T. Munishi, Nisha Owen, Elmer J. Topp-Jorgensen, Simon L. Lewis, 2016. Land cover change and carbon emissions over 100 years in an African biodiversity hotspot. Global change biology. Gillson L, Marchant R (2014) TREE 29(6): 317-325. Lane, Paul J. (2015). Archaeology in the age of the Anthropocene: A critical assessment of its scope and societal contributions. Journal of Field Archaeology 40: 485-498, http://dx.doi.org/10.1179/2042458215Y.0000000022. Platts PJ, Omeny PA, Marchant R (2015). AFRICLIM: high-resolution climate projections for ecological applications in Africa. Hazard, Benoit (2015). ‘Anthropocène’ in COP 21 Déprogrammer l’apocalypse, Sous la direction de Raymond Woessner, éditions Atlande. Hazard, Benoit (2015). ‘Scénario du changement climatique en Afrique de l’Est’, in Cop 21. Changement climatique, impact anthropique, COP 21 Déprogrammer l’apocalypse, sous la direction de Raymond Woessner, éditions Atlande. Adongo C, Hazard B (2015). ‘La géothermie : entre développement et énergie verte en Afrique de l’Est’, in COP 21 Déprogrammer l’apocalypse, ss. dir. de Raymond Woessner, éditions Atlande. Adongo C. 2015. Y a-t-il des énergies vertes? Le cas de la géothermie au Kenya. In: R Woessner (ed.) Déprogrammer l’apocalypse: le passe, la présentet l’avenir du climat: Les leçons pour éviter le pire. Paris. Hoogakker, B.A.A., Smith, R.S., Singarayer, J.S., Marchant, R., Prentice, I.C., Allen, J., Anderson, R.S., Bhagwat, S.A., Behling, H., Borisova, O. and Bush, M., et al., 2015. Terrestrial biosphere changes over the last 120 kyr and their impact on ocean δ 13C. Climate of Past Discussions, 11, pp. 1031-1091. Gillson, L; Marchant, R. 2014. From myopia to clarity: sharpening the focus of ecosystem management through the lens of palaeoecology. Trends in Ecology and Evolution 29: 317-325. Marchant, R, Lane, P. (2014). Past perspectives for the future: foundations for sustainable development in East Africa. Journal of Archaeological Science 51:12-21. Bollig, M. 2014. Resilience – analytical tool, bridging concept or development goal? Anthropological perspectives on the use of a border object. Zeitschrift für Ethnologie 139: 253-279. Series: Studies in Global Archaeology 24, ISSN 1651-1255. p. 294.
de Bont, Chris. 2018. Modernisation and farmer-led irrigation development in Africa: A study of state-farmer interactions in Tanzania. PhD thesis Stockholm University, Department of Human Geography. ISBN: 978-91-7797-224-2 (print). Githumbi, E.N., 2017. Holocene Environmental and Human Interactions in East Africa. Doctoral dissertation, University of York. Chuhila, Maxmillian J. 2016. Coming Down the Mountain A History of Land Use Change in Kilimanjaro, ca. 1920 to 2000s. PhD thesis, Oct 2016. University of Warwick, UK. Courtney Mustaphi, CJ, Marchant, R. 2016. A database of radiocarbon dates for palaeoenvironmental research in eastern Africa. Open Quaternary, 2: 3, pp. 1–7. [Map and access to data] [Data at Harvard Dataverse]. Kehrwald, N.M., Aleman, J.C., Coughlan, M., Courtney Mustaphi, C.J., Githumbi, E.N., Magi, B.I., Marlon, J.R., Power, M.J. 2016. One thousand years of fires: integrating proxy and model data. Frontiers in Biogography 8(1): 155-159. Petek, Nik (2015) An Archaeological Survey of the Lake Baringo Lowlands 2014: Preliminary Results, Nyame Akuma 83: 100-111. Courtney Mustaphi, CJ; Githumbi, E; Mutua, J; Muriuki, RM; Rucina, SM; Marchant, R. 2014. Ongoing sedimentological and palaeoecological investigations at Nyabuiyabui wetland, Kiptunga Forest Block, Eastern Mau Forest, Nakuru District, Kenya. Report to the Mau Forest Conservation Office, Kenya Forest Service, and the National Museums of Kenya Palaeobotany and Palynology Section. REAL contribution 002. 4 May 2014. 29 p.
Courtney Mustaphi, CJ; Githumbi, E; Shoemaker, A; Degefa, AZ; Petek, N; van der Plas, GW; Muriuki, RM; Rucina, SM; Marchant, R. 2014. Ongoing sedimentological and palaeoecological investigations at Lielerai Kimana and Ormakau Swamps, Kajiado District, Kenya. A report to the local authorities of Kimana and Namelok, Olive Branch Mission Africa Operations, and the National Museums of Kenya Palaeobotany and Palynology Section. REAL contribution 001. 29 April, 2014. 32 p.
Githumbi, E; Courtney Mustaphi, CJ; Deere, N; Marchant, R. 2014. Long Term Ecosystem and Landscape Dynamics in East Africa. University of York Environment Department Post Graduate Conference. York, UK. February, 20-21, 2014.